We recently asked our readers to share their biggest uncluttering and organizing hurdles and they responded. Now, we’re going through the comments to see what we can do to help. 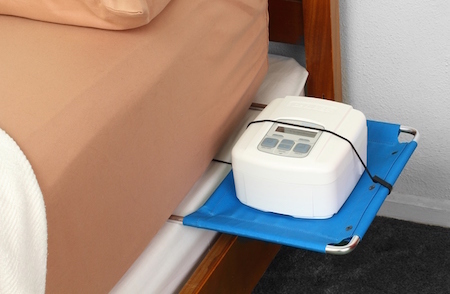 C-Pap Machines for sleep apnea … used every nite … sitting on a small table by my husband’s side of the bed and most visible from adjoining living room … long hose and face piece at end of hose … so ugly but so necessary … storage ideas but still convenient? Mary, there are a number of approaches you might use to address this challenge. While I’m going to list some specific solutions for CPAP machines, the strategies I’ve included could apply to any ugly-but-useful items we need to keep close at hand. 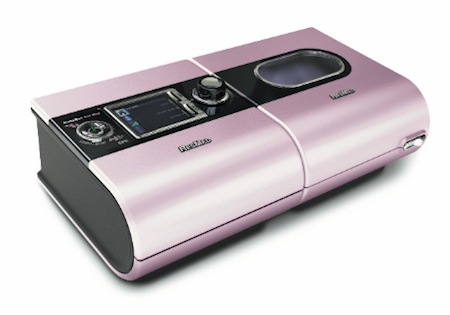 The ResMed S9 Autoset comes in pink, which some people think looks less clinical (and therefore more attractive) than the basic machine. 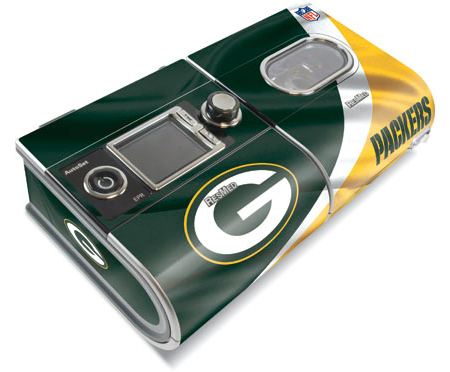 If you use a ResMed S9 device you can also get a skin (a vinyl decal) for it. Skinit has a program where you provide the image and the company turns it into a custom skin. You can also find a few Skinit ready-made skins (products the company has discontinued) on eBay and other sites. Building off the idea of the teapot cover called a cozy, some people have created CPAP machine and mask cozies. I’m not finding anyone who sells a CPAP cozy commercially, but you could either make one yourself or have one made for you. 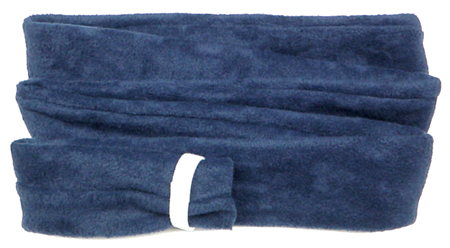 You can buy hose covers, which serve a functional purpose. But a cover also “makes the CPAP look less clinical,” as one Amazon buyer noted. You can also take the CPAP machine (and the hoses and mask) off the nightstand by putting everything into the nightstand. 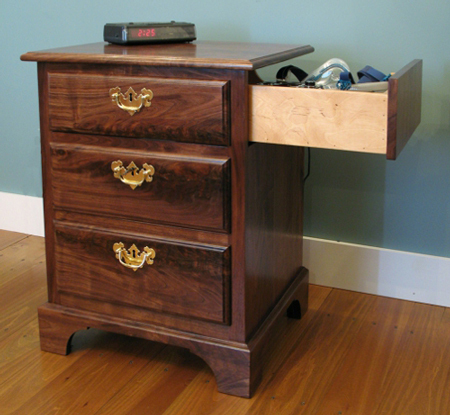 Perdue Woodworks makes a nightstand specifically for this purpose, but if you’ve got another nightstand where you’re willing to cut holes in the sides, you might be able to create your own. Denny Allen Cabinets has a different design, with a side-opening drawer, which could also work well. When you’re dealing with anything that’s unsightly yet useful, you may find a similar creative way to disguise or hide the item. For $160 (yes, the low, low price of $160! ), you too can hit a pothole and send 200ºF of pressurized liquid spray throughout the interior of your vehicle! 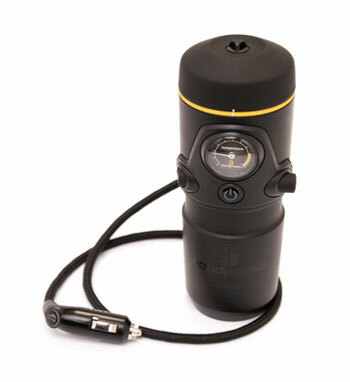 All you need is a 12v cigarette/electrical outlet, specialized ESE pods for brewing (sold separately), and a willingness to be scalded when you turn a corner or get into a fender bender. Also, imagine the wrecks you can cause by being the world’s most distracted driver when you pull the shot of espresso while going 65 mph on the highway! Clearly the developers of this product were of the impression that texting while driving wasn’t distracting drivers enough — they wanted to take distraction to the next level, and they succeeded! The Handpresso Auto Espresso Maker IS the NEXT LEVEL! Back in 2009, Brigid Schulte accepted a challenge to keep a time diary. 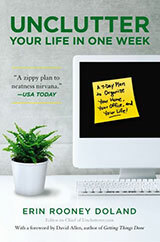 Her new book Overwhelmed covers both that time diary challenge and what Schulte went on to learn afterward. Did you know that your desk can help you with cable management? Check out these three desks that help keep cord clutter at bay. On the 14th, we asked our readers to share their biggest uncluttering hurdles and they responded. Now, we’re going through the comments to see what we can do to help. Today I’ll be looking at two questions: tech clutter and the sheer exhaustion of staying on top of it all. Let’s start with the gadgets. …Since [our kitchen] is by the back door [it has become a] landing pad for the cell phones and their chargers, especially for folks who are visual and need the reminder to take it with them…laptops and tablets end up all over the house, becoming visual clutter in the kitchen, dining room, and living room. Any suggestions on how to deal with this? This drives me crazy, too. With four of us living under one roof, I find phones, the iPad, and our laptops all over the place. When we have houseguests it gets even worse, as cables and devices seem to dangle from every available outlet. To combat this issue, I’ve hit everyone where it hurts: battery life. We have designated charging areas in our house: a so-called “telephone table” (it used to hold our land-line phone back when we had one) and the bedrooms. That’s it. If a device is not in a designated area, it does not get recharged, as moving cables from outlets is not allowed. The threat of a dead battery is enough to keep the digital clutter confined to one area. Smart planning will go a long way, too. is very inexpensive and easy to set up. I hope this helps. After a couple weeks of gentle reminders and some careful consideration, I think you’ll have a solution that everyone can use. But at the end of [my 12-hour day]…I am utterly pooped. I hire someone to do the dusting and bathrooms and floors, but that creates pressure to have the house decluttered before she comes each week. I have boxes still unpacked in the garage from when we moved 3 years ago, and we can barely get into the garage if we need something from them. I have dealt with high pressure decluttering situations by piling high a laundry basket and hiding it in my walk-in closet – now no one can get into the closet. 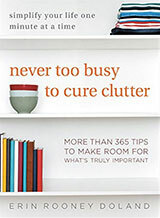 All the usual culprits — junk drawers, bathroom cupboards, closets, sheds, become repositories of clutter. While I feel we are coping with day-to-day life flow, I just cannot find a way to break this cycle and find the energy to tackle the big projects like the garage or closets. “Clean the garage” is a project. But at this point, it has become so intimidating that it’s super easy to avoid. Instead of avoiding it, I’ve broken it down into much smaller projects that are achievable. Perhaps this weekend you can find 30 minutes to sit with a pen and paper and list the categories of items you expect to find in the garage, like yard tools, holiday decorations, sports equipment, etc. When you’re done with that, you’re done. You’ve successfully made progress on the garage. Next time you have a fifteen minute block of time, plan out what your’e going to do with stuff that you aren’t going to keep. Will you donate it, sell it, give it away, take it to a consignment shop, the town dump, etc.? Again, getting those decisions made is another project completed. The week after that, dedicate just fifteen minutes to sorting through one type of category of your stuff in the garage (ONLY yard tools or ONLY holiday decorations). Find items that will be thrown away, for example, and then donate/sell/recycle/trash the items that need to be purged. Put the items you wish to keep in a pile or box out of the way for you to organize on another day. After fifteen minutes, you’re done. Another win. Do this with all your categories of items and then repeat it with organizing and putting away what you’ve planned to keep. It will take you many weeks, maybe months, to get the garage to your ideal, but you will get there. A little work at a time results in an uncluttered and organized garage, which is better than the chaos that is frustrating you now. Baby steps to success. This is how I deal with the craziness. My wife and I work full time and we’re raising two kids along with Cub Scouts, Girl Scouts, ballet, soccer, homework, and on and on. Even in the house, I break things down. “Today I’ll tidy up the mudroom area.” These small victories compound and I get stuff done without exhausting myself even further. An Unclutterer reader wrote in and talked about her four main struggles. 1. Finding pockets of time in the day to do large projects when you have small kids around. For example, I am trying to stain our wooden fence on our own, but I have two children under 3 years old. How can I approach this messy process strategically? I’ve been in this situation before. I had two young children and my husband was deployed for six months straight with the Canadian Forces. One suggestion would be to find some teenagers you can hire. You can ask around to neighbours and friends or visit the local secondary school or community centre if you don’t know any personally. Some teens would appreciate getting paid for a few hours of work per week painting your fence or keeping your children occupied while you work on the household chores. Another suggestion might be if you have friends with young children, you can do an exchange. One grown-up looks after all of the children and the other grown-up works on a project. The next time, you switch. Always underestimate the amount of work you’ll get done in the time that you have. If you think it will take you two hours to paint the fence, it may really take you four hours. Remember to include set-up and cleanup times in your estimate. Always have a Plan B. If you’ve booked a sitter so you can paint the fence, have an alternative project to work on (e.g. sewing curtains) in case it rains that day. Don’t fret if you’re not making as much progress as you’d like. Remember that slow and steady wins the race. 2. Overcoming analysis paralysis … how do I restore my decision-making confidence and JUST DO IT? For example, hanging art on the wall: it feels like a permanent choice! So I delay! As someone who has moved houses eight times in 23 years, I can say that nothing is “permanent,” some things might just take a little more effort to change than others. As far as hanging art on the walls, try GeckoTech Reusable Hooks. They are made with a unique synthetic rubber technology that allows them to be used again and again. 3M picture strips are also very handy for hanging artwork without damaging walls. You may also wish to consider the STAS cliprail pro Picture Hanging System. Apartment Therapy has great tips for hanging artwork so go ahead and make your house a home. 3. Thinking long-term about home projects, while on a budget. We plan to stay in our home a long time, but it needs some love. But our wallets are thin! What should we prioritize: remodeling the kitchen, or taking control of the landscaping? New interior paint job or pressure washing and re-glazing the pebble driveway? What house projects are most important and have lasting impact? Home renovations can make your home more comfortable, improve your living experience, and increase the value of the home. However, shoddy workmanship or too much “unique customization” may actually decrease the value of your home. Start with the basics by keeping the home safe and livable. Consider projects that involve your home’s structure (roof, windows, doors, etc.) or mechanical systems (furnace, air conditioning, electrics, plumbing). These upgrades make your home more energy efficient and may actually pay for themselves during the time that you live in the home. Insurance companies may also decrease premiums when you improve wiring, install secure windows, or add an alarm system. Next, think about making you home more livable. High-end countertops may look good in magazines but more cupboard space may be what your family needs right now. Discuss your ideas with a designer and talk to a few contractors to determine prices and see what fits with your budget. You may decide to do the work yourself, but talking about it with a professional is great for brewing ideas. Try to build the most flexibility and long-term usefulness into your designs. Remember that children grow quickly, so envision the basement toy room becoming a games room and study area in a few years. Installing the required wiring now will save you time and money later, and may also add a selling feature if you decide to move. You might be able to do some work yourself, such as painting or installing closet systems. However, because of permits and laws/regulations/codes, most people find it best to hire professionals for tasks requiring plumbing, electrical work, specialized carpentry, and work involving altering the structure of your home (supporting walls, roofs, staircases, etc.). 4. How can we encourage others in our life to take care of their clutter before they leave this earth and give all their clutter to us? This is especially a problem when they don’t think what they have is clutter! Unfortunately, the value of an item is in the eye of the beholder. Items you might consider clutter, might be of significant value to someone else. It would be difficult to ask someone to part with items that are valuable to him or her. You can’t control another person’s desires, wishes, and attachments to their things. However, there are some steps you can take to ensure that your family members’ items are appreciated once they pass on. Envision what you want for your family. Are you minimalists? Do you prefer art-deco style furniture? Will you travel? What hobbies do you enjoy or do you wish to start a few new hobbies? It helps to write down the lifestyle you want to lead and then act according to these visions when the time comes. Sometimes once people find they are no longer obligated to hold an item for you, they are more willing to let it go. Dave has declared his love of the wall calendar, and I agree with the points he made. I also know plenty of other people who work well with either paper wall calendars or planners they carry with them. But a digital calendar works best for me, so I thought I’d provide the other perspective. I have the advantage of being self-employed (so I have no employer-mandated calendar tools) and there are no other family members that I need to share a calendar with, so I have total freedom to select the calendar that works best for me. I happen to use Apple’s built-in calendar app, but there are many options for those who don’t use Apple products or who don’t like that particular app. Google Calendar, for example, is one that has a lot of fans, partly because it allows you to share a calendar with others. Since I can sync my desktop calendar to my smartphone, I always have an up-to-date calendar with me. If a client wants to book a next appointment, I know when I’m free. If the dentist needs to book another appointment, I can do that with confidence, too. It’s always backed up. My normal computer backup tools capture my calendar, so I never need to worry about it being lost (because I left it behind somewhere) or having it destroyed in some kind of disaster. I can do searches on it. If I want to know when I last had my car maintenance done, for example, I can find that out in a matter of seconds. If I want to know when my book club read a specific book, I can find that out, too. I can add more notes than I’d have room for on a paper calendar. For example, I can add airline, hotel, and rental car reservation numbers when I’m traveling. And I can include the URL for an event (even if the URL is very long), letting me link to additional information. I can do color-coding without having to worry about having specially colored pens or highlighters sitting around. For example, I use different colors for work appointments vs. personal appointments, and I find that helpful. I also use different colors for FYI items (such as community events that will cause traffic problems) and events I might want to attend but haven’t committed to. Data entry is simplified. All birthdays are added automatically from my address book. I can add repeating events, such as monthly meetings, so I don’t have to enter them individually. And I can easily move an appointment from one day to another if it gets rescheduled. If I enter the address of an appointment, my calendar will link to the Maps app, making it easy to determine the commute time and to navigate to where I’m going. My printing is pretty good, but I never have to worry about whether or not I can read my writing on a digital calendar. I can also cut and paste information, reducing the chance that I’ll make a mistake. So consider the pros and cons of both types of calendars, and select the one that works best for you. 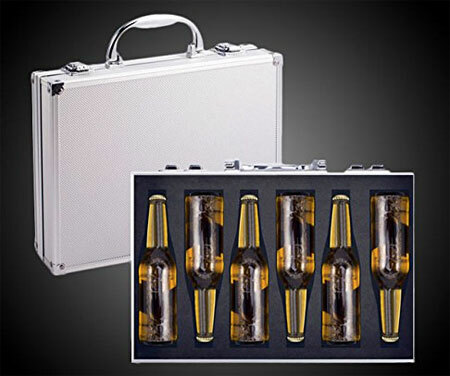 That’s right, it’s a briefcase for your bottles of beer. And, no, that isn’t some type of fancy cooling mechanism around those bottles, it’s regular foam. All it does is protect your bottles from clanging together, not chill them for drinking. Even if you were a beer distributor and wanted to bring samples of beers for your clients to taste, this would be less helpful for you than a small cooler. So. Um. Yeah. Definitely a unitasker. Thanks to Unclutterer Jacki for finding this gem for us. And, speaking of Jacki, I am sad to report that her last regular post with us will be next Monday, April 27. She’s retiring from online writing and our Unclutterer family isn’t going to be the same without her. We will miss all her Canadian and British spellings, her non-US insights, and especially her knowledge of uncluttering, organizing, and the manufacturing industry. The NuForce ?DAC gives you affordable high-end computer audio in a compact and simple package. The fourth and final winner in the ScanSnap giveaway is @teal64. Congratulations! How do you keep from being overwhelmed by magazines coming into your home? Jeri offers tips for keeping magazines from becoming clutter.